Even in tight economic times, snow-sport devotees can continue to enjoy skiing by taking advantage of sales, discounts, and alternatives to traditional ski packages. 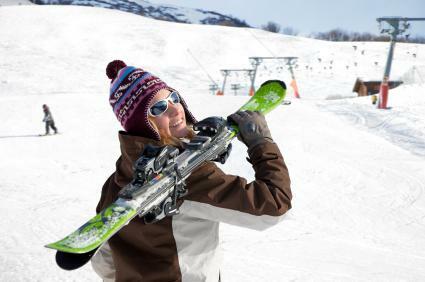 Although skiing and snowboarding are two of the most expensive recreational sports, there are a number of ways to save a considerable amount of money on snow-sport vacations. Finding great deals on ski vacations takes a bit of creativity and savvy researching skills. Ski enthusiasts should add these websites to their list of go-to resources when planning a ski vacation on a budget. Founded in 1971 as S&L Travel, Ski.com is the largest provider of mountain travel in North America. The site books vacations to 100 of the most popular ski resorts in North America, South America, and Europe. Ski.com's deals page offers deep discounts on lodging at popular ski resorts, as well as a selection of reasonably-priced ski-and-stay packages. Liftopia is an online clearing house that offers up to 80 percent off of lift tickets at popular ski resorts in the United States and Canada. The company was founded in San Francisco in 2005 and has grown from just seven resort partners into the largest online marketplace for ski lift tickets, boasting more than 250 resort partners. SnowPak.com showcases ski packages and snow vacation deals from a wide variety of ski vacation travel companies. Compiled by SnowPak President Robert Shirk, the Best Ski and Snowboard Vacation Deals page rounds up the packages that offer the best value for price. To make the list, packages must have a published price with a per person, nightly rate of approximately $100 and include more than one component, whether it's lodging, lift tickets, airport transfers, meals, or money-saving coupons. Snow.com, the online booking site for the Vail Resorts Management Company, offers deep discounts on ski vacations at the company's luxurious ski resorts in Colorado, Utah, Wyoming, and Lake Tahoe. Travelers can save up to 40 percent on ski vacation packages at popular resorts such as Vail Ski Resort, Beaver Creek, and Keystone Ski Resort. Ski Coupons is a discount travel website that offers savings on accommodations, lift tickets, ski and snowboard equipment rentals, and après ski. Ski enthusiasts can also find coupons that offer discounts at a wide range of local restaurants. Some coupons can be printed and used at the location, while others are in the form of codes that you can use when booking or purchasing online. The components of discounted ski vacations can vary widely by resort and package. The two most common types of packages are those that include airfare and lodging, or lodging and lift tickets. Some packages may also include "extras" such as meal vouchers, airport transfers, or coupons for services and equipment rental. Note that double occupancy is often required for packages that include lodging. This type of ski vacation package typically includes round-trip airfare and several nights at a hotel at, or near, popular ski resorts. The cost of the packages depends largely on the flight's departure and destination cities, as well as the type of hotel that's included. For example, a package that includes round-trip airfare from Dallas, Texas to Breckenridge, Colorado and four nights at a budget-friendly hotel starts at about $250 per person on average, while a package that includes four nights at a three-star, slope-side hotel starts at about $400 per person. Though these packages require ski enthusiasts to get to their ski resort destination under their own steam, they include the most important component of a great ski vacation: lift tickets. Prices vary depending on the resort and hotel included in the package. Packages that include lift tickets for lesser-known and out-of-the-way resorts often cost less, even if they include lodging at mid-range hotels. For example, ski-and-stay packages for Montana's Red Mountain Lodge start at $147 per person, per night for a budget hotel, while packages that include lodging at a luxury chateau start at $300. If you're looking to save even more money on your ski trip, consider some of these tips as well. The holidays and spring break are the most expensive times of the year for ski vacations. Prices also skyrocket during President's Day weekend. Some western resorts get great snow in November, and if the resort is open, skiers can get some excellent deals. However, terrain might be limited. When flying to a ski area, a midweek flight is typically less expensive than a Friday, Saturday, or Sunday flight. Also, since most airlines now charge for carrying skis and equipment, consider having your skis shipped directly to the hotel. Even if it turns out to be more expensive than taking the equipment on the flight, it can enable travelers to use public transportation, rather than expensive taxis and shuttles, when traveling to and from the airport. Compare costs to see if shipping your skis will save you money overall. Although the larger resorts get the most press, they are also the most expensive. Consider visiting smaller, lesser-known resorts instead. Not only are these less expensive, they are usually less crowded and offer a great ski vacation experience for the price. Renting condos or vacation homes directly from the owner, through a website such as Vacation Rental by Owner or FlipKey, can result in deep discounts for ski vacation travelers. Rental condos and homes often offer full-service kitchens, which can save a good deal of money on eating out. When traveling with a group or family, the cost of renting a home is often less than that of booking separate hotel rooms. A ski vacation doesn't have to break the bank. With some careful planning, even those on a shoestring budget can enjoy a great vacation on the slopes.